Purchase our quality products at the best prices. We also include a Bibliography of the research. Coats of Arms originated during the Crusades for the purpose of identification of an individual or family. Throughout the ages conditions have caused countries, boundaries, names, and languages to be changed. A Coat of Arms remains the same and represents the identity of the bearer. 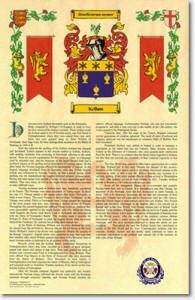 The colours (tinctures) and heraldic symbols (charges, ordinaries & sub ordinaries) on the Coat of Arms have real meaning and is the visual representative of the family name and qualities of the family it represents. These colours and symbols used in a Coat of Arms were chosen and designated to show a person’s allegiance, status, profession, locations, traditions & personal choices. From the crusades, Coats of Arms were the identifying symbol of a person, a family, group, Clan (Scottish Clan Badge) or Sept (Irish Separatist Badge) and helped distinguish friend from foe and to act as a rallying symbol. A Coat of Arms was unique to an individual in a country (no two families share the same Coat of Arms in the same country) and was easily recognised by all as so few were able to read. The Heralds ensured that no two were the same and no arms were bearing honours or ‘girdles’ that were not awarded to them. Many different or “sub-branch” coat of arms may also have evolved as families splintered, changed location or passed them to rightful heirs of those particular arms. That is why we often see marks of “cadence” ie: the crescent, which represents a second son etc. 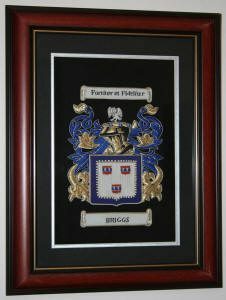 View our large range of heraldic products that we can personalize your Family Coat of Arms onto, eg, hand crafted shields, plaques, embroideries that you can pass down the generations as a family heirloom. Order your Coat of Arms on Shields, Plaques, Trophies, Embroideries, Scrolls, Mugs, T-shirts, Coasters, Flags, Stubby Holders, Mouse Mats, Surname Histories, Canvas, Solid Timber Hand Carved shield, Rings. All our products can be purchased on our web site (Worldwide purchasers). They are sent by registered/insured postage. 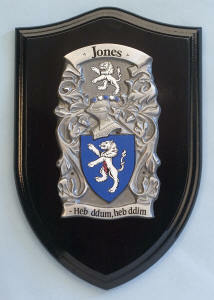 If you have a special item you want a Coat of Arms on, please contact us. We can place Your Corporate Logo on our Shields, Plaques, Trophies, Hand Embroideries and Flags, Canvas. Contact Susan for any help.